The Commissions on Elections (COMELEC) Website, introduces a Precinct Finder facility to verify the status of our registration record. By simply providing complete name and date of birth, we can easily see the status of our record online. This can be accessed anytime and anywhere provided that you have an Internet connection. In the old days you need to visit or call the local COMELEC offices if you want to inquire about your status. This online service from Commission on Election can answer some of your questions like; Am I already registered? What is the status of my registration record? Does my record have biometrics data? What is my precinct number? Or where is my polling center? 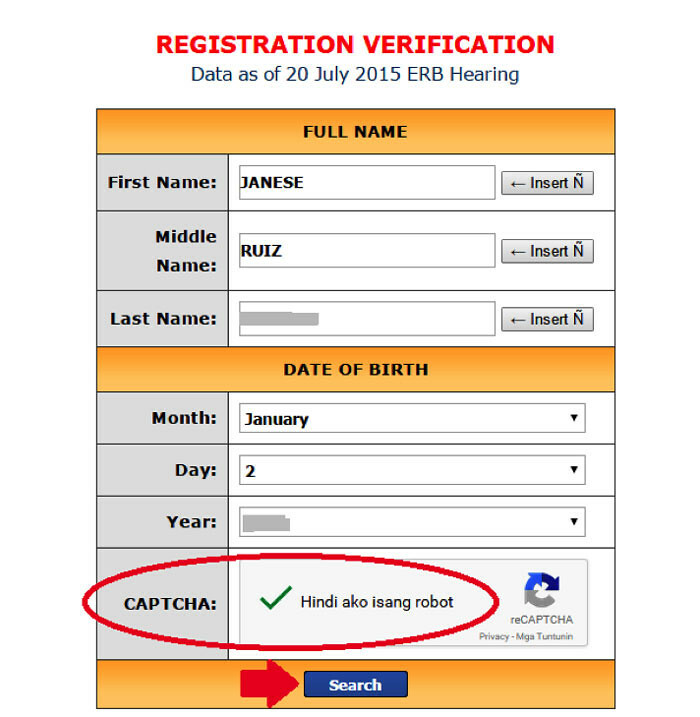 But, please take note that the records in online verification status that we can access online today is updated as of the last July 20, 2015 ERB hearing, which approved (or disapproved) applications filed on or before June 30, 2015. 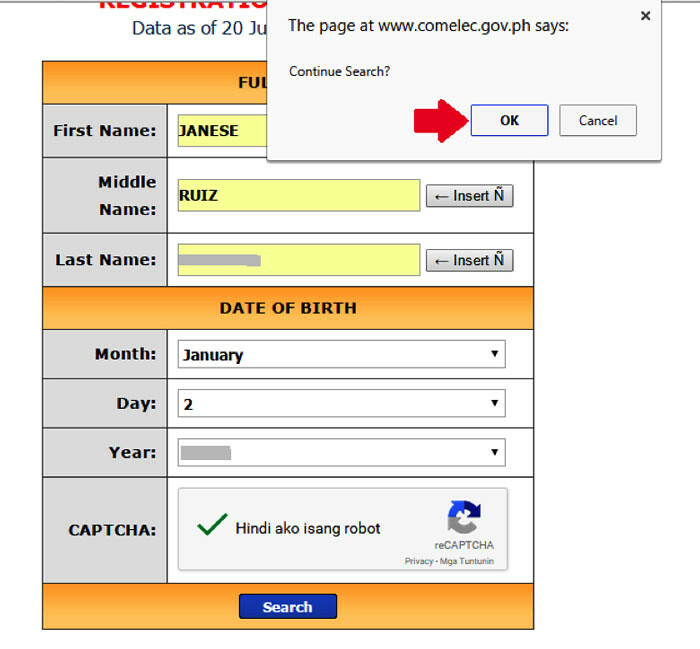 This means that if you filed your application after June 30, 2015, do not expect your record to be found (or updated). For overseas voters, this instruction is not for you, you can use the Post Finder instead. To make it easy for you, I’m preparing an easy to follow steps with screenshots, just follow along. 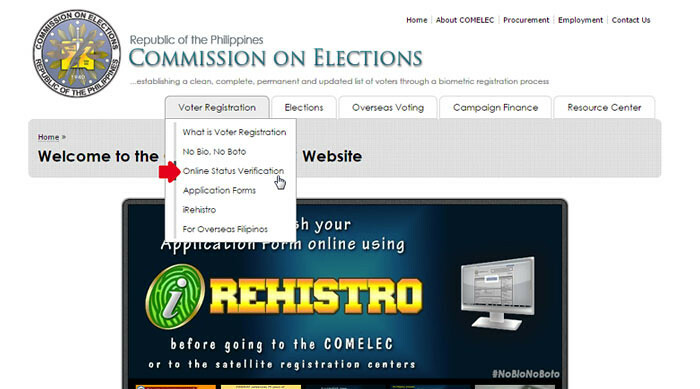 Go to the Commission on Elections (COMELEC) official website. On their Homepage hover your mouse to “Voter Registration” menu, then click “Online Status Verification” in the dropdown. See the screenshot. You will be directed to “Online Status Verification” Page, click “Precinct Finder” link. 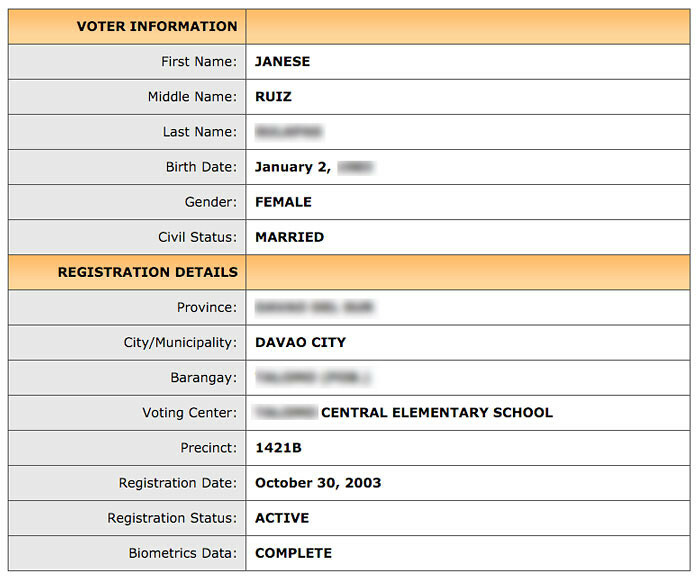 Under “Precinct Finder” Page, Provide your Full Name, Date of Birth. 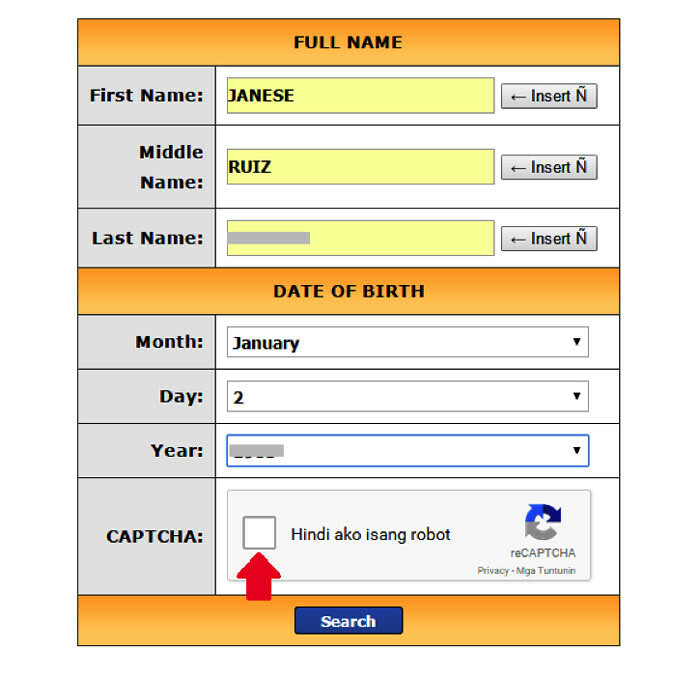 Don’t forget to click the box beside “Hindi ako isang robot”. You can see “check mark” under CAPTCHA verification. Now click “Search”. You will ask to continue search? Just click “OK” to confirm. That’s it. You can now review your Voter Information and Registration Details. You can also check if your Biometrics Data is complete. In accordance with the new law under Republic Act No. 10367 all voter registration records must have biometric information. All concerned is given until October 31, 2015 to comply with this requirement. Janese is a staff writer at EfrenNolasco.com features mostly Public Info, she loves writing Public Info to guide and broadcast to our kababayans the basic and useful information that can be use in our daily lives. She is residing in Davao City for more than a decade. She is a full time accounting staff. During her free time, you'll most likely find her wandering in the market acquiring best veg’s & fruits for her DIY fruits juicers & salad veg’s, she can do planking up to 190 seconds, or inventing her own organic skincare products from fruits & veg’s which includes facial scrubs & mask, nursing her dark spot. She wants to dedicate her life to her church obligation, to her family, and owning a charity center accessible to the public especially to the children.